Jack is a model student. He attends all his lectures and takes notes on them. He reads all the textbook chapters he’s assigned and highlights the key passages. But when he gets his results back from his mid term, he’s shocked that he’s failed. Jack runs to his professor’s office in distress and asks her what happened. “How did you study for the test?” she asks. 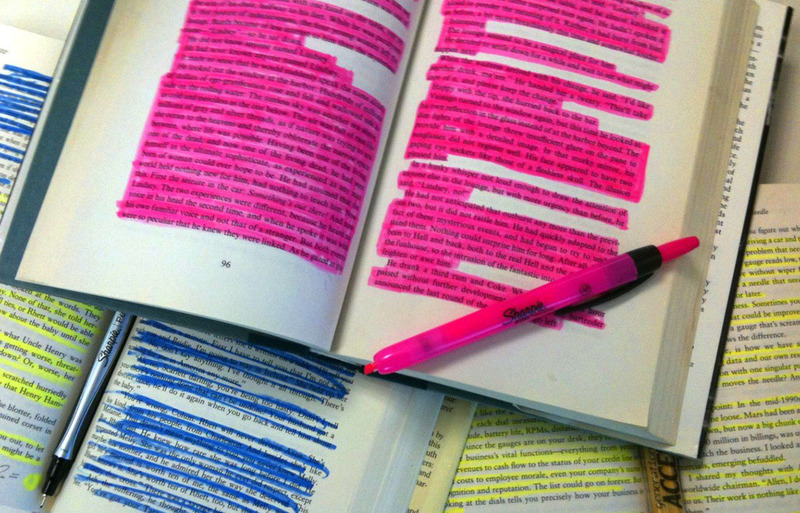 “I went back and highlighted my notes, then reviewed them along with the highlighted parts of my textbook until I felt I understood the material.” he says. Jack sees himself as a model student, but he is far from it – he doesn’t know how to learn effectively and is totally unaware of it. We can all identify with this story, whether it’s from rereading Spanish vocabulary that vanishes from our memory on test day or reviewing a speech for the morning meeting and forgetting every word when its time to present. What’s so frustrating when this happens is that, like Jack, we think we’ve done everything right. We start to question ourselves – maybe we didn’t work hard enough or we’re just not that good at test taking or public speaking. But these explanations are almost always false. The real problem comes from our tendency to fool ourselves which comes from what cognitive scientists call “illusions of knowing.” Strategies like rereading and highlighting create fluency, the belief that what's easy to remember now will be easy to remember tomorrow or next week. We feel we’ve mastered the material when we haven’t – all we’ve done is move it into our short term memory, which means we end up forgetting most of it. The best way to overcome our illusions is an effective studying technique in itself. That technique is testing or “retrieval practice” and the research proves that it’s highly effective in making learning deeper and more durable. In a 2006 study by Henry Roediger and Jeffrey Karpicke of Washington University, 120 undergraduate students were given two scientific texts to study – one on the sun and the other on sea otters. They studied one of the passages twice in separate seven-minute sessions. They then studied the other passage in one seven-minute session but in the second session, they were asked to write down as much as they could recall without looking. The students were then split into three groups, one which took a test five minutes after the study sessions, one two days later and one a week later. 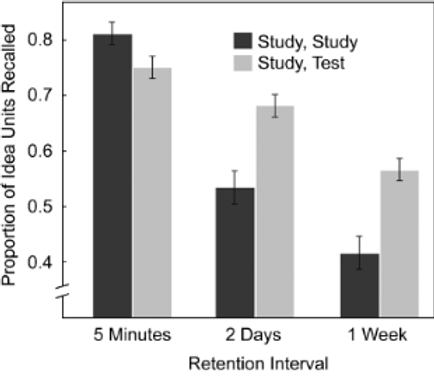 While studying or rereading was marginally more effective in the five-minute test, testing was far superior when it really mattered, in the one-week test. Tests are more than just a measurement tool. They change what we remember and how we organise information in our minds by making us engage in more “effortful” learning. Elizabeth and Robert Bjork’s “desirable difficulty” principle tells us that the harder our brains work to dig out a memory the more effective our learning will be. When the brain is retrieving texts, formulas, skills or anything else, it’s working harder than when it sees the information again. That extra effort increases the resulting storage and retrieval strength. In Make It Stick, Roediger highlights another benefit of testing. When we retrieve a fact, we re-store it in memory in a different way as it becomes linked to the other facts we’ve retrieved, making us even more likely to retain it. So whether it’s in the form of recitation, rehearsal or self-examination, testing is something that we should all use regularly in our learning for any subject or skill. Commonly used learning strategies like rereading may feel effective due to the feeling of fluency they cause but they are largely useless. Effective learning techniques are effortful – the harder they feel, the deeper and more durable learning will be. Testing or retrieval practice is an example of one such strategy and we should use this regularly in our learning schedules. After reading an article or text, pause and ask: what are the key ideas here? What message is the author is trying to communicate? Then try and write down as much as you can remember, without looking. After reading an idea for the first time, try to explain it to a friend or family member as soon as possible. If nobody’s around explain it out loud to yourself. You’ll quickly see where your knowledge falls short and what you need to review. Instead of waiting for the perfect moment, test yourself before you feel comfortable. If you’re learning a language, find a native to practice as soon as possible. If it’s a sport, get some competitive practice in.